Happy Sunday everyone! 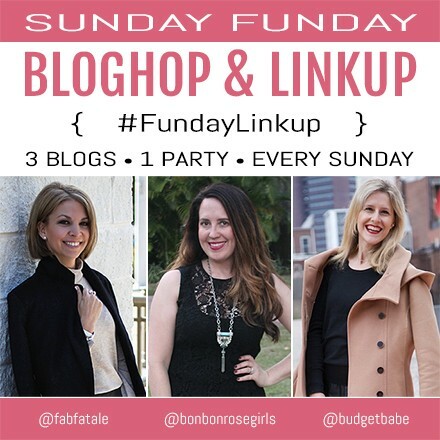 Welcome to the 4th edition of a new series we're dubbing the "Sunday Funday Bloghop & Linkup." Join me and my fellow hostesses Jennifer of Fab Fatale and Kristin of Bon Bon Rose Girls every Sunday morning at 8 a.m. for fun giveaways, good friends and inspiration to "try something new today"! Bloggers, please share your "best of the week" post in the linkup HERE so that we can all see what you've been up to. Our fav linkup each week will be featured at Fab Fatale, Bon Bon Rose Girls, and The Budget Babe blogs in next week's Sunday Funday edition! Readers, please join in the fun by checking out all of the linkups, hosted this week at Fab Fatale! We've also got a fun new giveaway. The prize: A $100 Kohl's gift card! Enter below...and good luck! Fab Fatale is giving away the entire Zoya Winter Wishes collection! PixieDust and liquid metals, yes please! Looking for a healthy appetizer to serve at your Super Bowl party? Give Bon Bon Rose Girls' Greek skewers a try! Spring forward with The Budget Babe's spot on Tory Burch Peach Suede D'Orsay Pump look for less! Congrats to Olive & Ivy! You are our #FundayLinkup fav of the week! We LOVE an outfit that's as strategic as it is stylish. Chelsea shows us that the dresses in our wardrobe can stay in regular rotation, even in these cold winter months! Head on over to her blog for styling advice on how to wear dresses on snow days. Thanks so much for sharing your super stylish outfit with our readers, Chelsea! Kimi Who wrote the perfect post for those of us who need to purge/sort/clean-out our nail polish collections. Inspiration for Moms shows us how a little paint can totally transform your lampshades. Simply Darrling shows you how to create brightly colored layered shots, perfect for Superbowl party debauchery! Lauren McBride nails it again with her casual-cool winter look. Happiness at Mid Life shares two colorful ways to wear one plaid jacket. Please check out Fab Fatale and the Bon Bon Rose Girls' favs of the week for more inspiration! One lucky reader will win this $100 Kohl's gift card giveaway! Follow the directions in the RaffleCopter below for a chance to win. Open to US residents of at least 18 years of age. No spam or inappropriate linkups, they will get deleted. Link to a post, rather than your homepage. Please include recent posts, preferably from this season. Please don't link and run, stick around to check out your fellow bloggers' linkups. Not required, but lots of love for following your hostesses at their socials linked below. Use the hashtag #FundayLinkup to share your "best of the week" linkup with other party goers at Pinterest, Twitter, Facebook, and Instagram (and anywhere else you may be inclined to use a hashtag)! Please head on over to Fab Fatale this week to add your "best of the week" linkup. Thanks Heidi, always love reading your posts - thanks for sharing! Thank you so much for featuring a link to my post! I'm glad you enjoyed it. Can you believe I am still waiting for the nail polish I ordered that prompted my need to make some space!? Ahhh! Oh no! All that empty space must be driving you crazy now lol you'll fill it soon enough!